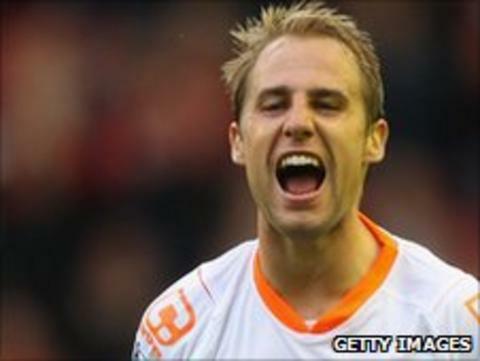 Portsmouth have signed Derby County striker Luke Varney on a three-year deal for an undisclosed fee. Varney, who made only 15 appearances for the Rams, spent last season on loan with Blackpool, scoring five goals in 30 appearances for the Seasiders. The 28-year-old is Pompey's third summer signing following the arrival of Bournemouth skipper Jason Pearce and Ipswich midfielder David Norris. "Luke leaves with our very best wishes," said Derby boss Nigel Clough. "Despite not being in our first-team plans, he has been a great professional and shown an exemplary attitude on and off the training pitch." Varney began his career at Leicestershire club Quorn FC before moving to Crewe Alexandra in 2003, where he managed 35 goals in 108 matches. A £2m move to Charlton followed in 2007, with Varney scoring 10 goals in 39 starts, before his transfer to Pride Park in 2008. But the forward only managed 10 league starts during his time with the Rams, and spent the entire 2009/10 season with Sheffield Wednesday, netting nine times. It has also been reported that Pompey are planning to make a £1m bid for Southampton winger Jason Puncheon.